3. Display - 6.2" FHD+ display, brightness, contrast, color temperature, sRGB coverage, etc. Ulefone Armor 6 is the latest addition to Ulefone's Armor series of ruggedized smartphones. Up to now, every consecutive model has been better compared to its previous sibling and on paper, the Armor 6 seems to be the best of all - improved design and ergonomics, better display, more powerful chipset. All this comes as an addition to the already proven IP68, IP69K and MIL-STD-810G certifications for resistance to dust, water, shock, drops, humidity, pressure, acidic atmosphere, solar radiation and temperature extremes. 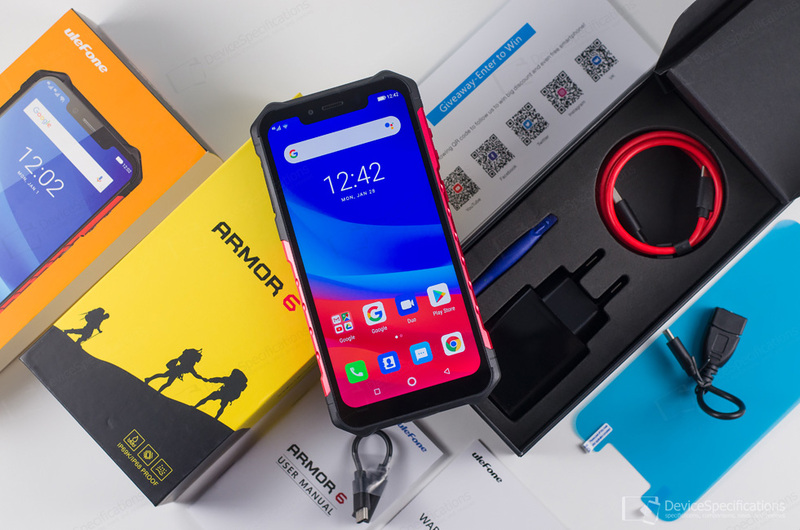 Thin and elegant, compared to similar ruggedized smartphones, the Armor 6 has all the bangs and whistles to become one of the most preferred ruggedized smartphones in the first quarter of 2019. You can buy an Ulefone Armor 6 at a promotional price from Amazon DE, Ulefone's official store on AliExpress, GearBest or Banggood. Ulefone Armor 6 is equipped with a 6.2-inch IPS display with an FHD+ resolution (1080 x 2264 pixels), 360 cd/m2 typical brightness and covers 100% of the NTSC colour reference space. The display is protected by a Corning Gorilla Glass 5 while the rest of the body is a combination of metal, rubber and tough polycarbonate. All sensitive parts are properly sealed so that the IP68 and IP69K requirements are met. The device also has a MIL-STD-810G certificate for resistance to drops, shock, pressure, humidity, acidic atmosphere, temperature extremes, etc. The handset is based on a MediaTek Helio P60 (MT6771) chipset. Fabricated on TSMC's 12 nm process, it packs an octa-core CPU with 4x 2GHz Cortex-A73 cores and 4x 2GHz Cortex-A53 cores. A tri-core Mali-G72 MP3 GPU clocked 800 MHz handles the graphics. Power is supplied by a 5000 mAh battery which supports MediaTek Pump Express, 18W fast charging and 10W Qi wireless charging. There are 6GB of dual-channel LPDDR4X RAM clocked at 1600MHz and 128GB of storage that can be expanded with up to 256GB. The display has a wide notch that houses a LED notification light and the front-facing camera, which employs an 8MP Sony IMX134 sensor with an f/1.8 lens and supports face unlock. On the back, there's a fingerprint sensor adjoined by a dual camera module with a dual LED flash as well as a UV sensor. The main shooter combines a 16MP Samsung S5K3P9 ISOCELL Bright sensor with an f/1.8 lens and PDAF, while the auxiliary snapper has an 8MP GalaxyCore GC8034 sensor. The Armor 6 has a hybrid, dual Nano-SIM trays with both SIM cards supporting 4G LTE Cat. 7 and VoLTE simultaneously. The network bands supported by both cards are as follows: 2G GSM (2/3/5/8), 2.5G CDMA (BC0/BC1), 3G WCDMA (1/2/4/5/8), 3G TD-SCDMA (34/39), 4G TDD-LTE (34/38/39/40/41) and 4G FDD-LTE (1/2/3/4/5/7/8/12/17/19/20/2BA/28B). 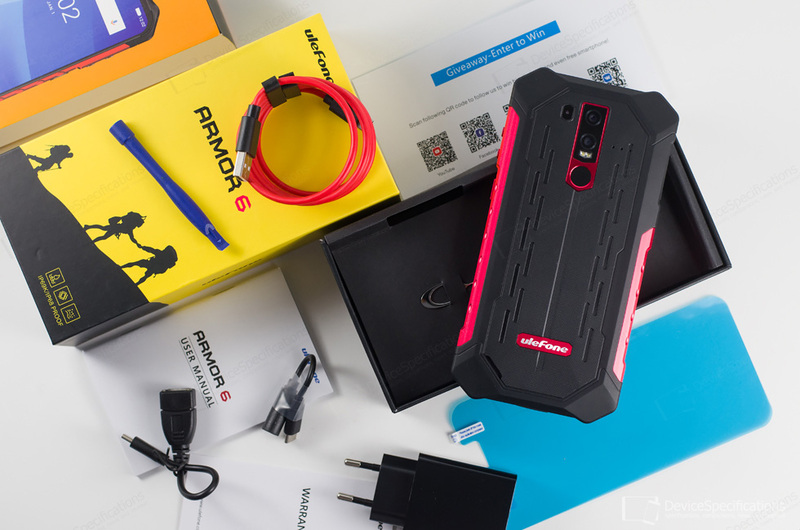 The wireless connectivity options of the Ulefone Armor 6 include Bluetooth 4.2, dual-band Wi-Fi 802.11 a/b/g/n, Wi-Fi Direct, Wi-Fi Hotspot, Wi-Fi Display. The smartphone also supports NFC with Android Beam and works with GPS, GLONASS and Beidou. The model is equipped with a USB Type-C 2.0 port with OTG support and an FS1610S smart audio chip. There's no 3.5 mm jack, which as usual is compensated by a headphone adapter included in the package. The model runs on Android 8.1 Oreo with Ulefone's skin on top. It also includes a number of software tools for active outdoor experiences, including a UV sensor. Complete Ulefone Armor 6 specifications.